While I do enjoy the experience of going for a ride, many times I like to have some kind of destination in mind and most of those involve food! We plan to put our recipes from the road in this section. Either delicious road food that we are cooking ourselves or local recipes we find along the way. 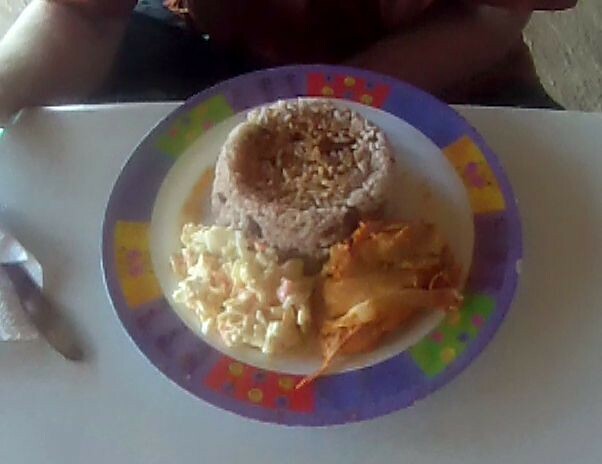 This is The Dish of Belizean food. 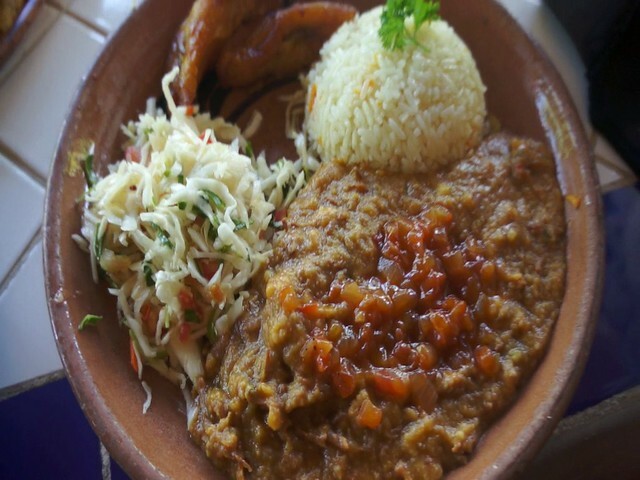 Many Belizeans will eat some version of this for one of their 3 meals a day. Rub recado (or substitute) thinly over chicken with either a bit of oil or fat. Heat oil in large pot and brown chicken in heated oil. Add onion to partly browned chicken. Pour off excess fat and add vinegar and water, and let simmer 5 minutes. Boil beans till tender for ~1.5 hours adding ½ onion and garlic during last 15 minutes. Add coconut cream and the remaining onion with salt and pepper. Rinse rice then add to pot of beans. Cook gently for 20 minutes or until liquid is absorbed. Add more water until rice is cooked. To thicken gravy add 3 tsp of corn starch to ½ cup of cold water then simmer for an additional 5 minutes. Pour chicken and sauce over rice and beans. In Belize they serve this with some type of coleslaw, pasta, potato salad or fried plantains. 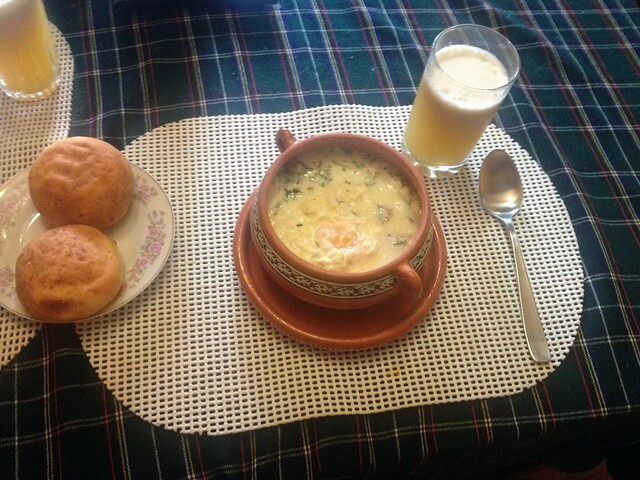 Signature Dish from Guanajuato Mexico. Featured in episode 6 of Hungry Riders. 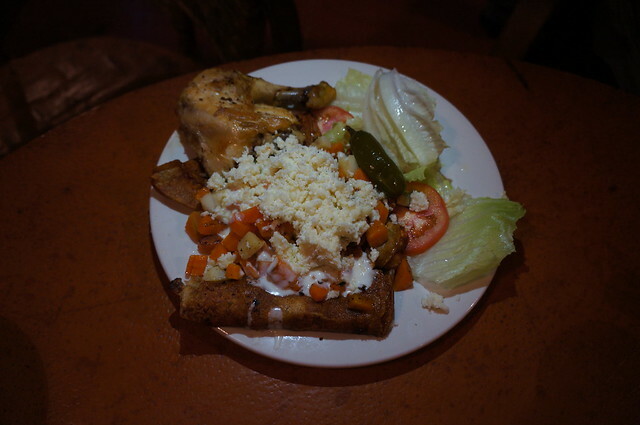 This dish loads up on carbs for hungry miners (Hence the Mineras). An interesting twist on a classic Mexican enchilada. Boil water in order to cook chunks of potato and carrots until done but firm. 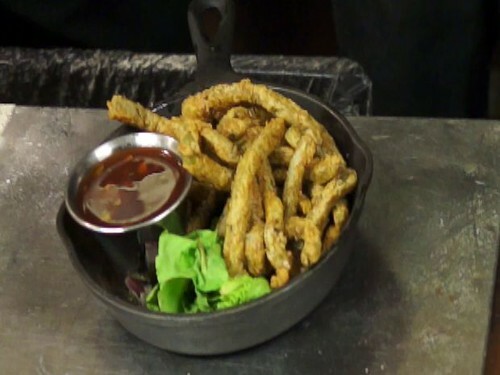 Roast cleaned chiles in a skillet until bubbled but not burned, then soak for 20 minutes in hot water until soft. Using a blender puree ¼ of the onion, garlic, oregano, dash of cayeanne and salt, then add and blend soaked chiles for the sauce. Strain using small sieve and separate out the liquid. Heat oil in skillet to soften tortillas. Dip tortilla briefly in oil turning immediately. Then dip tortilla in enchilada sauce and roll tightly with Cotija cheese. Cooked shredded chicken would also work. Fry potato and carrots in oil remaining oil, with a little of the enchilada sauce for flavor. Pour additional sauce over enchiladas, then add potatoes, carrots, some diced onion, and additional cheese to taste. 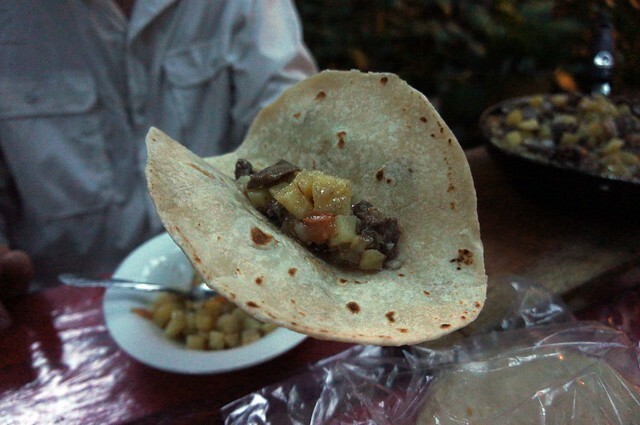 This was the Tarahumara dish we made in Batopilas in Episode 5 of Hungry Riders. It is a 1 pot meal that someone could make almost anywhere though I am not sure it will taste the same without a wood fire. There are many ways someone could add to this to more suit their tastes. This is a very hearty meal that will feed a large group. Chop everything into small bite sized cubes: potato, onion, tomato, and beef. Cook the potatoes in a generous amount of oil, not to fry them, but just to cook through. the potatoes are not really fried, but just cooked through. Then add the beef, onions, garlic, and tomatoes, and cook an additional 5 minutes. Once cooked through, almost like a very thick stew, serve in tortillas and eat with your hands. With my American palate, I would add some pepper. I am sure people will add a number of ingredients to this recipe, so let us know how it turns out! 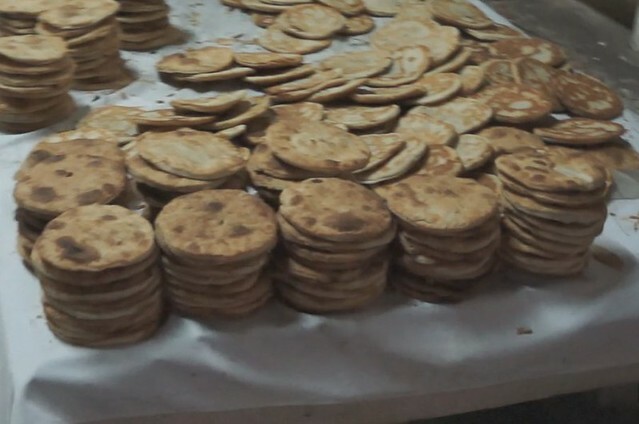 Also keep in mind, this is an example of what the Tarahumara are eating now, because for quite a while their diet consisted primarily of corn. These are a delicious pastry found primarily in the Hermosillo region of Sonora in Mexico. This was the closest recipe to Dona Maria from hungry riders Episode 4. The name Coyota is mestizo and means “daughter of Indigene and Spaniard – sweet, dark skinned and full of grace.” An exquisite hybrid and a modern empanada. 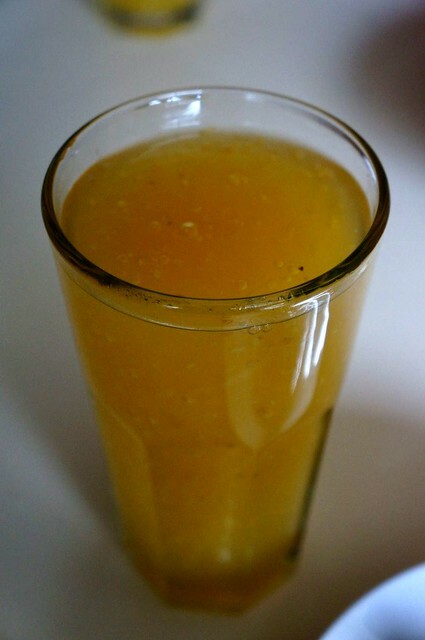 In a cup of water dissolve 2 piloncillos, set aside. Crush the other 4 piloncillos and mix in 5 tablespoons of flour. Mix well by hand and set aside. In a separate mixing bowl add flour, shortening, yeast, water with dissolved piloncillo and mix well until reaching a doughy consistency. Add more water if needed. With a knife or fork, poke holes on top of each one, place on baking sheet and brush with egg, bake until golden, 350F. Note, your oven will likely take longer than the wood fired ones at Dona Maria.